We have been using HeLa cells in my laboratory since 1982, when I arrived at Columbia University Medical Center fresh from postdoctoral work with David Baltimore at MIT. I brought with me a line of HeLa cells and used them for 30 years for our research on viruses. Here is a story of how we lost the cells and then found them ten months later. As everyone knows, the continuous HeLa cell line was derived from a cervical tumor taken from Henrietta Lacks in 1951 (if you don’t know the story, you should read Rebecca Skloot’s The Immortal Life of Henrietta Lacks, or my shorter summary). When I arrived at the Baltimore lab in 1979, they were using cells derived from the S3 clone of HeLa cells that had been produced by Philip Marcus in the 1950s. I write ‘derived from’ because someone at MIT had further cloned the S3 line and selected one that was particularly susceptible and permissive to poliovirus infection. This was the cell line that I took with me to Columbia in 1982. Because we use so many HeLa cells each week, we grow them in spinner cultures (pictured). 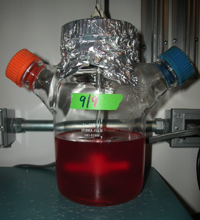 The cells are suspended in a glass bottle in nutrient medium and continuously stirred by a magnetic bar. The spinner bottle is placed on top of a stir plate, which contains a motor that drives a rotating magnet that in turn spins the bar in the bottle. When we need to produce monolayers of cells for experiments, we remove cells from suspension and plate them on plastic dishes. The HeLa S3 clone that we use grows very well in suspension and also forms excellent monolayers on plastic dishes. Over the years we used the HeLa S3 subclone to conduct experiments with poliovirus, echoviruses, Coxsackieviruses, enteroviruses, rhinoviruses, and encephalomyocarditis virus. The cells could be infected with all these viruses, develop cytopathic effects, and form plaques, allowing titration of virus titers. They have been an essential part of my laboratory. The Wall of Polio is just one example of how important these cells have been for our work. In December 2012, the spinner went down. The drive belt that turns the magnet in the spinner platform broke overnight; the cells settled out and died. Normally we would simply go to our stock of cells frozen in liquid nitrogen, thaw them out, and be up and working again within a week. Unfortunately, our liquid nitrogen tank had run dry one week in the summer of 2012, and all the cells had died. We tried recovering some of the HeLa cells that were frozen, but what grew out were not the same as our S3 subclone. In the course of the next 9 months we tried HeLa cells from many different sources – laboratories here at Columbia, the American Type Culture Collection, and our colleagues elsewhere. None of the HeLa cells performed like our S3 subclone. Some HeLa lines did not grow well in spinner; others did, but formed poor monolayers. Still others did not support replication or plaque formation when infected with viruses we work on now – poliovirus, rhinoviruses, and encephalomyocarditis virus. I located former members of the Baltimore laboratory, hoping that they had taken the special HeLa cells with them, but I came up empty handed. A few weeks ago I received an email from a former student who had heard my pleas for HeLa cell help on This Week in Virology. She remembered bringing some of our HeLa cells to her postdoctoral laboratory in Canada, and freezing them down when she left. I contacted the laboratory and found to my delight that our HeLa cells were indeed frozen there; a kind member of the laboratory grew up a stock of the cells, froze them, and shipped them off to us. I received them a week ago and put them into culture. They were the HeLa cells that I used to know: I recognized their morphology immediately. They grew beautifully as monolayers, and just today I set up a spinner culture. We are all looking forward to using the cells in our virology experiments. Meanwhile, I have a large stock of belts for the magnetic spinner plate (I had to buy seventeen of them, to meet the $50 minimum order); I have placed 6 vials of the cells in our liquid nitrogen tank; and I plan to freeze additional vials in my colleagues’ freezers in case ours goes down again. There are several lessons to be learned from this saga. First, because virologists are completely dependent on cells, they must take care that they have a reliable stock. This means having someone in the lab checking the level of liquid nitrogen every day, and ordering a new tank when the level is low. Second, it’s important to keep stocks of cells frozen elsewhere. We were very lucky to find them in Canada. Third, HeLa cell lines are very different. Finally, HeLa cells are special. I don’t know of any other cell line that grows well in spinner, makes beautiful monolayers, and allows us to work with so many different viruses. Thank you, Henrietta Lacks. I’m a little surprised that you were the only one working with this subclone. It sounds almost like a miracle line for virologists, given how well it grows in both suspension and monolayer, and that it can be infected with important viruses. What do other people use, and how do you deal with the problem that results might be influenced by your given subclone? I suppose in a way that’s an advantage, since other people will/won’t replicate it, though that assumes replication actually happens. We actually just discovered an entire box is missing from our liquid nitrogen tank. ALL my FCWF cells were in that one box. Thankfully we have a colleague who also uses them so some new FCWF cells should be on their way. I will do as you suggested and squirrel some vials into different boxes in different racks to make sure this doesn’t happen again! Also, any suggestions on how to do a whole genome sequencing on a virus that seems to cell adapt rather quickly!?!? We are having problems consistenly generating a mouse virulent virus in quantities that we can do whole genome sequencing with. RAW264.7 cells are cultured in a spinner quite nicely, and they also form monolayers. Perfect for plaque assays! Very educative for young scientists…. Beautiful story. I’m glad I was able to visit the lab the day you looked at the first plating of this new HeLa batch. They did indeed look just like the ones I used all the time (and took for granted) in graduate school. You could maybe use multiple displacement amplification to get enough DNA to sequence. At least if it’s a DNA virus. For an RNA virus you’d need enough RNA to do an RT first. Not sure what the limits on that are. Sounds like you ought to automate the task of checking the liquid nitrogen tank. The really interesting question here is what is the difference between the various HeLa clones? If you knew then maybe you could alter the cells to suit your purposes perhaps by transfection or gene silencing. I was just listening to episode 230, when I saw this blog post! I am so glad that you were able to recover your cells from another lab. Cells are everything for biologists. I have had conversations with my advisor that we should really be part of cell biology rather than just microbiology since we have less in common with bacteria and parasites, other than that viruses can infect them. I had a quick question. I have noticed that if I take HeLa and Vero cells out many passages I cannot transfect them. Do you ever transfect your HeLa cells? And if so, how well do they transfect? ballchinian, how would you automate the task of checking the liquid nitrogen tank? I am sure we are not the only labs working with this clone – if I had not located the cells I would have likely found one. I think our problem is special as we want to grow the cells in spinner, plate them out, and have them susceptible/permissive to a wide range of viruses. We’ve found a wide range of transformation efficiencies in all the HeLa we’ve used. Our current favorite S3 clone gives us 50-75% expression with a GFP plasmid. The other lines were much worse. Good question – one that would take a long time to sort out, and which is probably not worth the effort. We could hook up a temperature sensor that would send an email, or call a cell phone, when the nitrogen level got below a certain point. But then someone would have to manually order a new tank. Probably an improvement over what we have now. Agreed. You could get enough viral RNA to reverse transcribe – a few micrograms should be enough for a 7.5 kb genome. Surely this is a problem for the core facilities at Columbia? I guess plenty of groups use cell culture, and they all need some space in a liquid nitrogen store. If all the tanks are stored in the same place, and all the groups pay “rent”, then someone can be paid to fill all the tanks twice a week, order the liquid nitrogen deliveries etc. What you are suggesting makes perfect sense, and happens at many places. I remember at the Blood Research Group in SFO, they had all the liquid nitrogen freezers on one floor, with nitrogen piped in from a large external tank. All were linked to send phone calls if they warmed up. Here this would never happen – too many scientists just interested in their own domains. Different departments with individual needs and interests. No one would bother to organize this. Sad but true.